How to choose ppr pipes? The real PPR pipes should meet the standard Din8077/8088 -- The performance of pseudo-PPR pipes and fittings will not reach the above criteria. It should be noted that the pseudo-PPR pipe life is only 1--5 years, while the real life of PPR pipes are more than 50 years. PPR pipes widely used in industrial and residential buildings in the life, health and drinking water supply and hot water heating. PPR hot and cold water pipes divided two kinds. Cold water pipe wall is thin, hot pipe wall thick. so a lot of good in terms of fracture resistance properties of hot water pipes, hot water pipes price also more expensive than cold water pipe of some. Many manufacturers to be safe, hot and cold water, regardless of the construction process, cracking, improve the safety factor. 1. Good flexibility PPR pipes, fittings and easily deformed by squeezing, even if the deformation is not broken, and greatly reduce the amount of joint use. 4. Long life PPR pipes, fittings and strong anti-aging, the normal role of the mission more than 50 years. 5. Quick and easy construction PPR pipes and fittings become very flexible construction makes quick and easy connection (socket connection with hot melt machine), safe and reliable. 6. Affordable As the construction is simple, and there is no contradiction between the impact and other projects, shorten the construction period, the construction cost than copper save 60%, with excellent economy. Therefore, be careful when consumers buy, be sure to choose the right, large manufacturers, quality assurance of the pipe, the other in the installation, but also pay attention to some points, might listen to expert advice. Expert advice: to let through professional training of skilled workers to operate. At the same time, the process is also very important. Shall be in accordance with the principle of smooth vertical and horizontal, on the basis of the ground the room is larger than the pipe diameter of the slotted deep grooves, and then laying PPR pipes, followed by one order of hot melt connection. After all PPR interface uses hot-melt technology to integrate together to be more than 24 hours of pressure testing, if the field environment allows pressure test time can be longer. When we are sure there is no leakage of water seepage phenomenon, and then landfilled. 1, the connection between the PPR pipe and fitting should be welding. 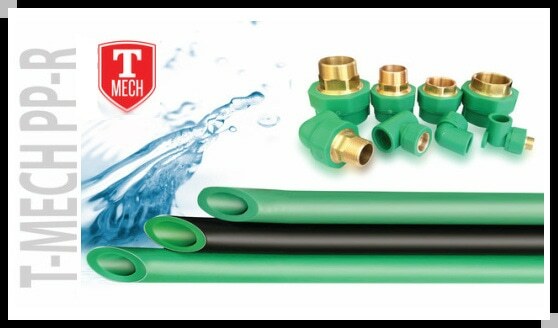 For the metal pipe connection we can use flange connection, but to connect with water applicator must be used with metal insert pipe fittings. 2, We should use professional pipe cutter to cut the pipe, which will guarantee smooth incision. 3, Be sure to clean up the PPR pipe and fitting welding parts to prevent sand and dust to damage the joint quality. 4, We should heating the ppr pipe and fittings according to the regulation time when welding the pipe and fittings. 5, Insert the pipe and fittings into identified depth to the welding tools without rotating. 6, After the completion of the heating, immediately join the pipes and pipe fittings for connection. You can adjust the pipe and fitting in a certain time if you find the position is wrong during the connection. 7. After the connection, we should wait for a cooling time to use the pipe and fittings. Connected pipes and fittings should be done on the wall or the ground with color paint to mark the location of the pipeline, so that you can avoid damaged by redecorate. Do PPR pipes resist to acid and alkaline? The acidity and alkaline of our drinking water is expressed in in pH in chemistry, pH = 7 to neutral, pH < 7 as acidity, pH > 7 is alkaline, One simple method to measure the PH degree of acid and alkali is to use pH indicator paper. You can test the PH by yourself to experience of drinking water PH value if you have that paper in hand. The world health organization did not mention clear standard for the drinking water quality. Our GB5749 drinking water hygiene pH indicator is in 6.5 to 8.5; GB17324 bottled drinking water pH indicator is in 5.0 to 7.0. These indicators and the developed countries, in line with the standard of water can be rest assured to drink. PP plastics are chemically inert, so Ppr pipe is resistant to general acidic medium. Due to the chemical inertness of PPR pipe, it has a strong resistance to alcohol, acid, alkali and low boiling point hydrocarbon solvent. At indoor temperature, ppr materials are difficult to be dissolved in most organic solvents. And when in Water-based reagent like acid or alkali, the possibility of environmental stress cracking damage is very small. but when with chlorinated organic compounds, strong oxidizer, liquid hydrocarbon contact, it is easy to cause surface crack or swelling, because nonpolar compounds can be easily absorbed by polypropylene. PPR pipes can resist general acidic medium, but not strong acid and strong base. Therefore, if ppr pipes are for general residential use, no need to worry about the resistance issue. If you are visiting Dubai for a weekend or during a transit on a long trip, it is important to get the maximum of your Dubai short break. Luckily, Dubai has plenty of options to choose from. Also please check below information to explore Dubai. Dubai has sunshine throughout the year and it’s really lively during the night. Therefore you have more hours to spend in one day. During our five year stay in Dubai, we visit many places in Dubai and other cities in the UAE. Anyone who is planning a Dubai short break would be able to use them. We highly recommend Lama Tours in Dubai for all your day trip requirements. We have personally used them many times. For us, below were the best short break options out of many. You can pick what ever you want based on your preferences and available time. Dubai is one of the best cities in the world. Go for a short-trip to the city is an ideal option during your Dubai short break. Within about 4 hours you should be able to see the beautiful Jumeirah beach and Burj Al Arab 7 star hotel, the Camel Race Track, Dubai Race & Golf Club, Sheikh's Palace. Jumeirah is about 40 minutes drive from the city centre. There are few things youshould be able to cover in this trip. Visit the world famous 7 star hotel (Burj Al Arab). Remember they will charge you a small fee to enter the hotel. Have a sea bath and relax in the beautiful Jumeirah beach. Visit Wild Wadi Water Park. This is one of the best water parks in the world. There is a variety of water rides, both adventurous and relaxed type. You can purchase two types of tickets. One for the whole day and the other one is for a few hours. I recommend getting a ticket for the whole day. Because you will never feel enough. It is so much fun. This place is absolutely a “must visit” in Dubai. This is a must do activity in Dubai. This will take half a day, but worth spending that time even during a short break in Dubai. This historic focal point of life in Dubai, The Creek, a natural sea-water inlet which cuts through the centre of the city. It is very interesting to see the colour and bustle of the loading and unloading of dhows which still ply ancient trade routes to places as distant as India and East Africa. Dubai is one of the most beautiful, modern and well kept city of the world. In this country the tourist can experience everything from rugged mountains and awe-inspiring sand dunes to sandy beaches and lush green parks, from dusty villages to luxurious residential districts and from ancient houses with wind towers to ultra-modern shopping malls. The Emirate is both a dynamic international business center and a laid-back tourist escape. What are ppr pipes, applications, features, and advantages? PPR pipe means Pipe made of Polypropylene Random Copolymer (Polypropylene Random Copolymer type 3). The raw material of PPR pipe is Polypropylene Random Copolymer (PPR-C). The production of ppr pipe should comply with Din8077/8078 standards. The PPR pipes designed for the distribution of hot and cold water. Generally speaking, PPR pipe includes below application, features, and application. ▪ HVAC and Compressed air installations. ▪ PPR pipes plumbing systems have a unique multiple layer design. ▪ PPR pipes are designed as the most hygienic system for the transportation of portable water. ▪ PPR pipe have a long life time over 50 years even in the cold and high temperature and stress pressure sitiation. ▪ PPR pipe provides easy installation as compared to all other piping systems. ▪ PPR pipe is non-corrosive, non-calcifiable and has non-contracting diameter relative to the conventional systems. ▪ PPR Plumbing System has same joints. ▪ Low thermal conductivity of Vectus Systems offers energy efficiency. Polypropylene Random Copolymer as a new type of pipe material, it has many advantages. Issued by Thomsun General Trading LLC, reproduce please indicate the source. Thomsun was established in the year 1976 in Dubai UAE by directors Mr.K.V. Thomas, Mr. V.T. John and Mr. P. Srinivas. The vision and work ethic etched out over the years with the foresight to diversify into new disciplines at the right times have seen the activities of the group grow to become the multi-faceted and diversified entity it is today. 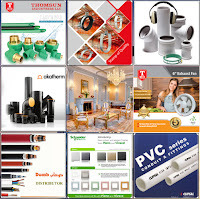 With a strong history and credibility, Thomsun over the years has business interests in various core industries in the Gulf and Indian subcontinent. Thomsun General Trading is a member of Thomsun Group, who operates as one stop shop electro-mechanical solutions provider. 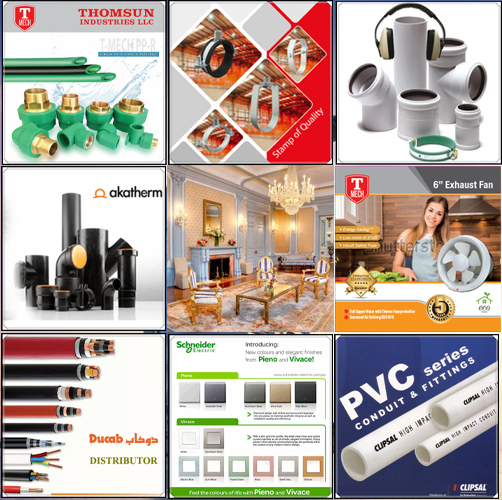 Thomsun General Trading LLC, based in Dubai Investment Park, is a leading mechanical products supplier, electrical products supplier in UAE. We are a professional ppr pipes manufacturers and pipe clamps suppliers. Main Market: GCC Countries & world wide. Thomsun General trading have been an established and popular company with an excellent track record for the best customer satisfaction. We have never compromised on the quality and the services provided to the customer. We believe in keeping the customers happy and providing them with products at a very competent price. We have an excellent staffs who will guide you with their best ideas by keeping in constant touch with your company and informing about the market trends. 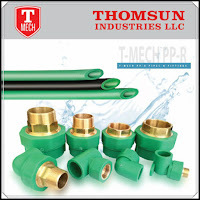 Thomsun General Trading operate towards a vision to be the best and the most professional ppr pipe manufacturers and pipe clamps suppliers and other electrical mechanical products distributor in the United Arab Emirates (UAE). Please feel free to contact us for any questions about our products. We look forward to a wonderful relationship together and success for all concerned.